In a major decision, the Third District Court of Appeal has issued its long-awaited opinion in a case watched closely by condominium and home owner associations around the state. In Deutsche Bank Trust Co v. Beauvais, the entire Court decided on April 13, 2016 that a mortgage holder who files a second foreclosure suit more than 5 years after a first suit that accelerated the entire mortgage debt and was later dismissed is not barred from enforcing the mortgage, even though the statute of limitations is 5 years. In short, the Court reasoned that each successive missed payment creates a new default and an independent right in the mortgage holder to accelerate payment on the note in a subsequent foreclosure action, and it does not matter if the first suit was dismissed “with prejudice” or “without prejudice.” Such “en banc” decisions of the whole Court are rare, but this one was even more unusual because six judges agreed in a 31 page opinion, while four judges disagreed with the majority in a 35 page dissenting opinion. The majority opinion overturned the earlier 3-0 ruling of the same Court, but the new decision is now consistent with the opinions of the four other District Courts of Appeal in Florida. In Beauvais, the Court reasoned that after the first dismissal the parties are left back in the position they were in before the first suit was filed. However, the dissent also pointed out that nothing in the language of the note or mortgage mentioned that dismissal of a foreclosure suit somehow reverses the previous acceleration of the entire debt (a “de-acceleration”) or somehow reinstates the installment nature of the note. Nor did the Order of Dismissal de-accelerate the entire loan in the first case, and there was no evidence that the lender did that in any way after the first suit was filed or dismissed. The dissent concluded that the majority opinion was re-writing the terms of the note and mortgage which a Court cannot do, and effectively re-writing the statute of limitations which runs from the date of acceleration, not the date of a missed payment. Thus, absent unusual facts in a different case, if the bank files a new foreclosure suit more than 5 years after filing an earlier one, associations who have acquired title to property by foreclosing a lien probably cannot defend the case successfully based on the running of the statute of limitations. All the bank needs to do is allege there was a new default and new acceleration of the balance of the note. However, every case is still dependent on its own facts. Question: If the bank accelerated the loan in a letter instead of in the Complaint and waited 5 years to file, would that be a meaningful difference? Obviously, with a 66 page opinion decided by a vote of 6-4 which cites many other significant opinions as precedent for both the majority and dissenting opinions, my foregoing analysis is an extreme simplification of a complex issue. 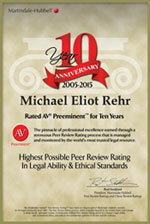 If you want to discuss this further, or read other articles I have written, please feel free to browse my website – www.rehrlaw.com, email me at mrehr@rehrlaw.com, or call me at (305) 670-8993.